Last summer I purchased a battery-powered lawnmower. I did it because I wanted to do my small little part for the environment, but I have to admit it wasn’t an easy decision. Sacrificing power to ensure the air is a little bit cleaner wasn’t something I was originally willing to do. It was my wife who eventually convinced me by making me recognize that while we might not face the consequences of excessive consumerism, our children would. That doesn’t mean I was willing to trade all of my power tools in for the environmentally friendly version, but it was a start. Now I find myself increasingly considering the purchase of a battery-powered chainsaw; the GreenWorks 20312 G-MAX seems to be a good option. 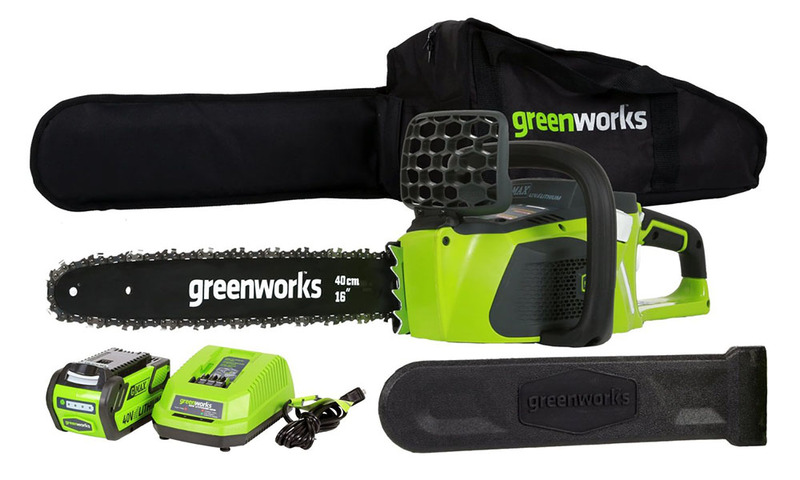 It has comparable power to a lot of other consumer model chainsaws and it’s priced reasonably. You can normally purchase this model for less than $300. Typically, when I head out into the yard with my chainsaw I expect to spend one or two hours getting the job done. I would say I have about 40 to 50 branches to cut every time. This GreenWorks chainsaw is designed to make up to 100 cuts on a single charge so it’s more than capable of handling this type of job. Perhaps if you have a lot of trees and bushes in your yard you may need to have a second battery on hand just in case, but for most amateur gardeners 100 cuts should be more than enough. The great thing about GreenWorks is that they make all their battery-powered tools compatible. That means you can easily use one battery to operate multiple different tools. It will save you a lot of money on batteries if you own several different compatible products, and it will give you the peace of mind of not having to charge several different batteries at once. All you really need is two – one in the tool that you’re using and another that’s charging as a backup. The 20312 G-MAX is designed with brushless motors. If you’re not sure what that means, you’re probably not alone. Essentially this type of motor is more efficient, offering up to 30% more torque and providing you with better cutting capabilities. It makes up for some of the power you lose by not having a gasoline-powered engine running your chainsaw. A great thing about battery-powered tools is that they make a lot less noise and produce a lot less vibration than their gasoline-powered counterparts. That means you won’t have to worry about rattling those fillings loose or experiencing excessive wear on your body. Battery-powered chainsaws do produce some noise and vibration, of course – it’s just a lot less noticeable. Probably the last thing your spouse wants to do is rush you to the hospital because you haven’t operated your chainsaw safely. Fortunately, the G-MAX has some built-in safeguards. It has a chain brake and low kickback chain that’s designed to automatically shut off if it senses the chainsaw kicking back quickly. It’s a feature that will definitely add to your family’s peace of mind. The blade bar on this GreenWoks chainsaw isn’t the longest one you’ll find, but at 16-inches it’s still decent. You may not be able to reach the highest branches, but you’ll reach all the lower hanging ones that are normally the ones you’re likely to be worried about anyway. It’s not bad for a reasonably priced, battery-powered chainsaw. If there’s one feature that almost all consumers love about electric and battery-powered power tools, it’s the fact that you can start them with the push of a button and they almost always start on the first push. It can be much more difficult getting your gasoline-powered chainsaw started. With this chainsaw don’t have to yank on a cord and potentially throw your shoulder out to get it started. If you have any injuries, such as rotator cuff problems, this is an important consideration. I’ve lived through that pain and it’s not pleasant. Another key feature of the battery-powered GreenWorks 20312 G-MAX is that it’s very lightweight. This machine weights less than 7 lbs., which is less than even the lightest gasoline-powered models. Its lightweight design makes it easy to handle and easy to store out of the way when you’re not using it. You know what they say – you can’t please everyone, and that’s true with respect to this chainsaw as well. While the reviews are mostly positive there were some complaints about the batteries lasting power, as you might expect. There have also been some complaints about its durability – some claim it only works for a few months and after that it’s virtually useless. These people are in the minority though, as most reviews are positive. I’m still not 100% sold on the idea of switching to a battery-powered chainsaw, but if I did make that decision I think the GreenWorks 20312 G-MAX would be a good choice. It has adequate cutting power, and the fact that it’s capable of making up to 100 cuts on a single charge is impressive. The fact that this machine is also lightweight, low noise, and low vibration are also good selling features. If you’re looking to make the transition from gasoline-powered power tools to environmentally-friendly options, then you should give this one a second look.